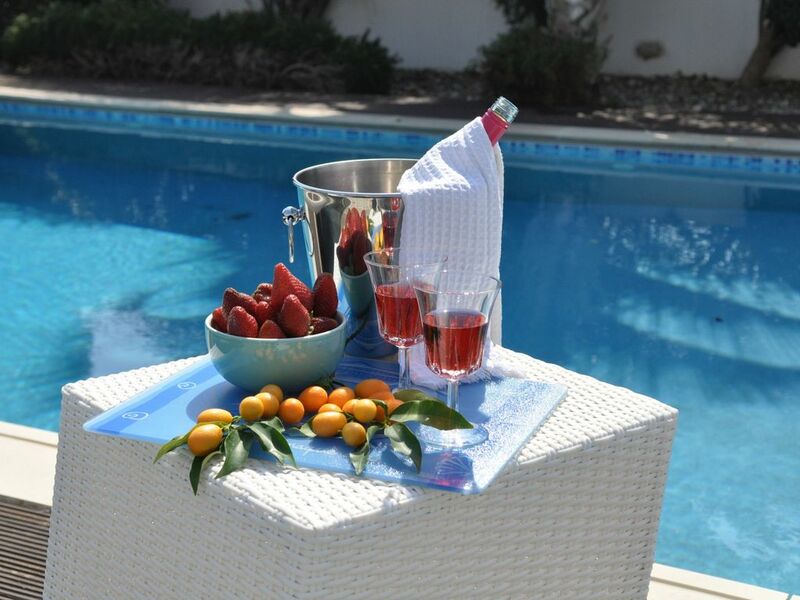 Katikies 22 is a luxury detached 3 bedroom bungalow situated in a 500 square meter plot in a private residential development, 150m flat walk to the Blue Flag Pissouri Beach. Fully furnished open plan living/dining and kitchen area, with big patio doors leading out to the garden area with a private swimming pool, built-in BBQ, outside shower, grassed area and fruit trees. It has is own gated driveway and parking for two cars. Fully equipped modern kitchen with dining table and seating for 6 . Master bedroom has 1 double bed, dressing table, bedside tables with lamps and fitted wardrobes. 2nd bedroom has 2 single beds with pull out beds underneath, bedside tables with lamps and fitted wardrobes. 3rd bedroom has 1 single bed with pull out bed underneath, bedside table with lamp and fitted wardrobes. Main bathroom has a bath with jacuzzi, vanity unit with hand basin and w.c. 2nd bathroom with shower, vanity unit with hand basin & w.c. All linen and towels are provided, except beach/pool towels. Fully air-conditioned throughout. Shutters on all doors and windows. We have other villas very close, available for friends and families who wish to stay close by. Pissouri Beach is a mixture of sand and pebbles.It carries the EU Blue Flag for cleanliness, with safe swimming, life guard on duty, a beautiful unspoilt bay. Sunbeds and parasols can be hired in the summer months. Water sports for hire include jet-ski, wind-surfing, snorkelling, sailing, paragliding and water-skiing. Small boats can also be hired if you want to discover other coves around the coast. Pissouri is located on the South Coast of the island and is very laid back and relaxed, ideal for those that want to unwind and revel in the peacefulness of the resort. Pissouri Village has managed to retain its traditional Cypriot charm. With sultana grapes covering the surrounding countryside, this is one of the principal wine growing regions of Cyprus. To the north of Pissouri village, one can see the majestic Troodos Mountains and to the south and east there are panoramic views of the coast, across vineyards, carob and olive trees. Golf: With more than three championship courses on the island, Cyprus is becoming increasingly popular for golfing holidays. Although three courses are conveniently situated within a 15-minute drive of the villa, each one is very different and offers an excellent variety of challenging holes and beautiful views. Secret Valley Golf Club - 10 Minutes drive - Lies in a scenic valley surrounded by beautiful sculptured rock formations near Petra tou Rominou, the legendary birthplace of Aphrodite, the goddess of love. The clubhouse is a rural Cypriot designed building with locker rooms and includes a pro-shop, restaurant, bar and golf academy. Aphrodite Hills Golf Club - 10 Minutes drive , has been carved out of carob groves and olives trees on two high plateau divided by a dramatic ravine. Designed by world-renowned Cabell Robinson, it boasts spectacular views overlooking the Mediterranean Sea together with generously wide fairways. The clubhouse offers an elegant and intimate ambience for private parties, corporate events and romantic wedding celebrations. MINTHIS HILLS GOLF CLUB - Is situated in the hills around the village of Tsada,15 km north-east from the city of Paphos.